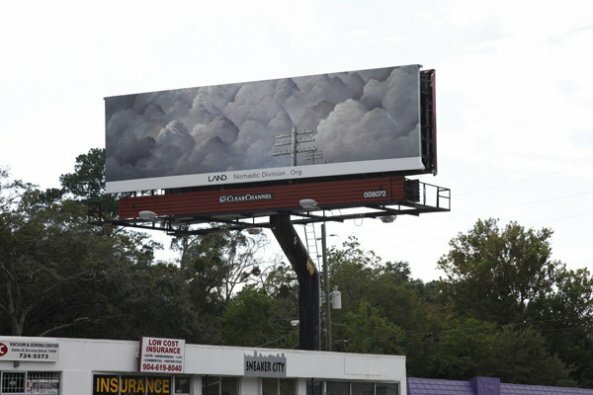 Shana Lutker, “Onward and Upward,” 10 billboards, Jackonville, FL, 2013. 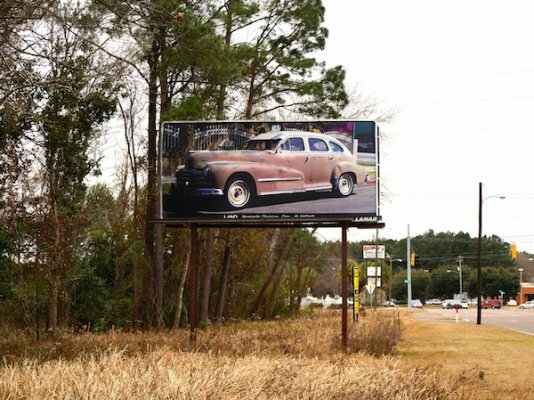 Mario Ybarra Jr., “Barrio Aesthetics,” 10 billboards, Mobile, AL, 2014. Sanford Biggers, “The Great Afar,” 10 billboards, New Orleans, LA, 2014. 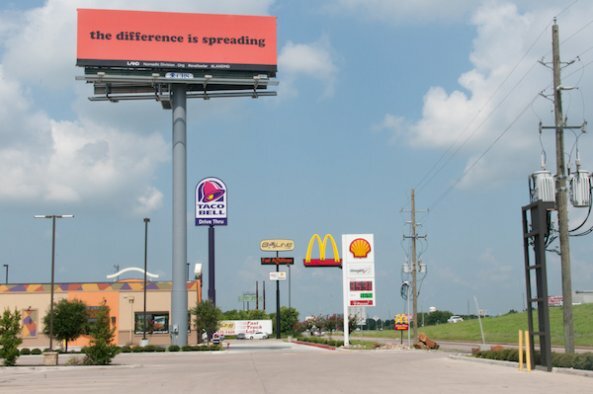 Eve Fowler, “it is so, is it so,” 10 billboards, Houston, TX, 2014. 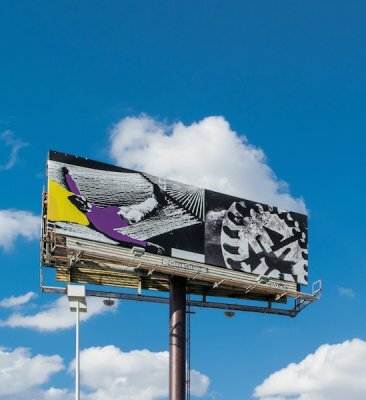 John Baldessari, “Love and Work,” 10 billboards, San Antonio, TX, 2014. 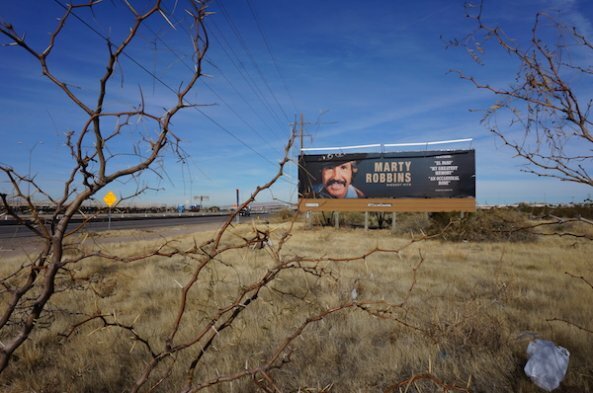 Jeremy Shaw, “Marty Robbins Biggest Hits,” 10 billboards, El Paso, TX, 2015. 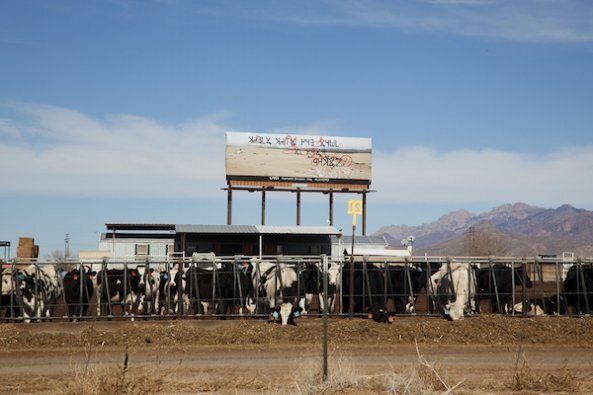 Daniel R. Small, “Pending Cipher for the Open Present,” 10 billboards, Las Cruces, NM, 2015. 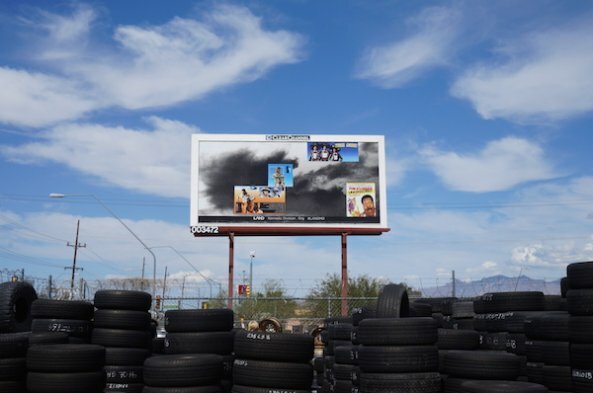 Bobbi Woods, 10 billboards, Tucson, AZ, 2015. Zoe Crosher, “LA-LIKE: Shangri-LA’d,” 10 billboards, Palm Springs, CA, 2015. For Crosher, this kind of reflection is key to the Manifest Destiny Billboard Project. 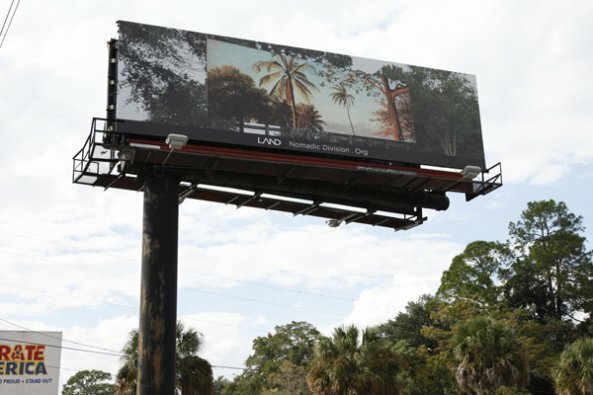 The first 10 billboards went up in Jacksonville, Florida, in October 2013—Shana Lutker’s “Onward and Upward” series, which showed historic images of skies, like a painting of pre-Spanish Florida or a photo of Jacksonville in 1909. Whizzing by on the freeway, drivers catch a glimpse of a double image—one skyline superimposed on top of another. After Florida, billboards popped across the I-10 east to west—from Alabama and Louisiana to three cities in Texas, then on to New Mexico, Arizona, and finally California. The last chapter, by Matthew Brannon, will be installed in L.A. in late June, to coincide with a culminating weekend of events and exhibitions throughout the city related to the project’s themes. Several of the project’s artists played with the device of repetition so often used in traditional advertising—using the same image on every billboard so it became ingrained in commuters’ minds. For his chapter, “Love and Work,” in San Antonio, John Baldessari created a split image of a man reclining in a hammock and a huge black-and-white gear. The visual parallel of man and machine, and leisure and labor speaks to “the precarious balancing act that is both America’s ambition and the source of many of its most salient problems,” according to the project description. Crosher’s own chapter, “LA-LIKE: Shangri-LA’d,” went up along the I-10 in Palm Springs in April 2015. 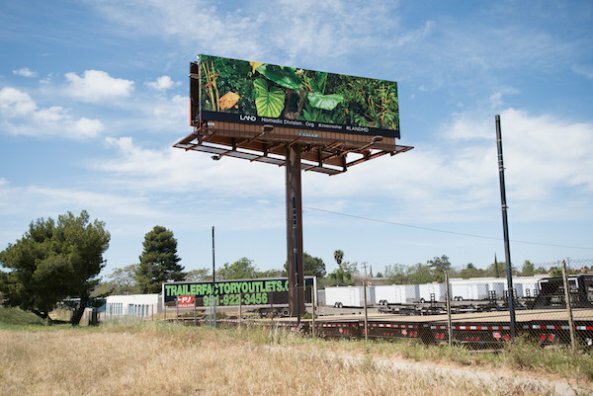 Her billboards show lush green foliage—which is meant to symbolize the promise of abundance in contrast to the desert that surrounds it—that becomes increasingly brown and withered as you progress through the billboards. The Manifest Destiny Billboard Project’s Culminating Weekend takes place across Los Angeles from June 24 to 28. 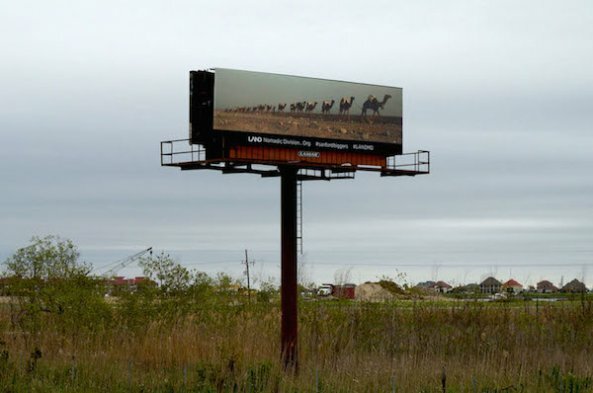 *Photos courtesy of A LAND Exhibition: The Manifest Destiny Billboard Project, Max Fields, and Jennifer Siu-Rivera. This was written this for Open Art, a partnership of the Getty and Zócalo Public Square.